(TibetanReview.net, Mar31’16) – Chinese authorities have imposed tight new restrictions on monasteries in Rebgong (Chinese: Tongren) County of Malho (Huangnan) Prefecture, Qinghai Province, including especially by banning any display of pictures of the Dalai Lama, Tibet’s exile spiritual leader, reported the Tibetan Service of Radio Free Asia (Washington) Mar 29. The new restrictions, which are in the form of a set of four directives and had been in the works over the past more than one year, were formally declared in the politically sensitive month of March this year, the report said. 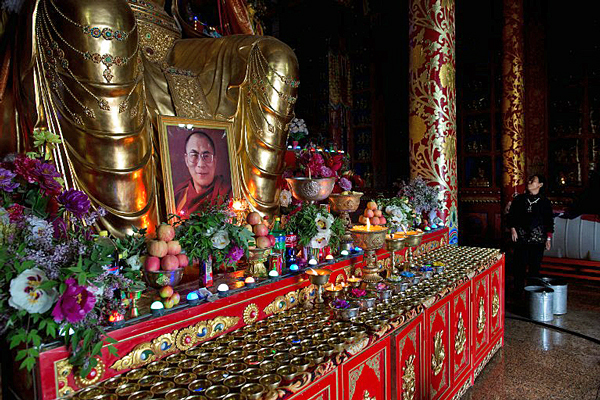 The report cited an exile Tibetan source with local contacts as saying that at the 14th century Rongwo Monastery, the most prominent place of worship in the county, located 124 kilometres (77 miles) from the provincial capital Xining, the directives were announce d with warnings of severe legal punishments for any violation thereof. Directive number one orders the monks to strictly follow the leadership of the monastery’s resident management committee. The Chinese government set up this committee, made up of ranking local communist party members and government officials, in each monastery in 2012. Its authority superseded that of the existing so-called Democratic Management Committee headed by monastery monks appointed by the Chinese authorities. Directive number two requires monks who are custodians of the monastery’s shrines and temples to sign an undertaking to strictly follow the orders and instructions issued by the management committee. Directive number three orders monks in charge of temples and shrines to – apart from ensuring the safety of all the statues and other properties of the monastery – prevent fellow-monks from engaging in activities that could supposedly bring disgrace to the monasteries, such as by putting up posters against Chinese policies in Tibet or by staging protests, including by means of self-immolation. And directive number four orders the removal of all statues and pictures, if any, of the Dalai Lama from the monastery’s shrines and temples. Severe punishments were to follow both on the monastery and concerned monks for any violation of this directive. Monks found guilty of such violations will be expelled from the monastery and could be handed over to the legal authorities for prosecution. And shrines and temples that refuse to follow the instructions could be closed down, the directive was further cited as saying. Committee members themselves are under pressure to bring results, having been made responsible for the conduct of the monks. The authorities were reported to have assigned one local government official to every one or two monks to regularly educate them on government policies meant to be followed in the monastery.